At Bath Planet, we believe that everyone deserves a relaxing, elegant bathroom that is both functional and beautiful. 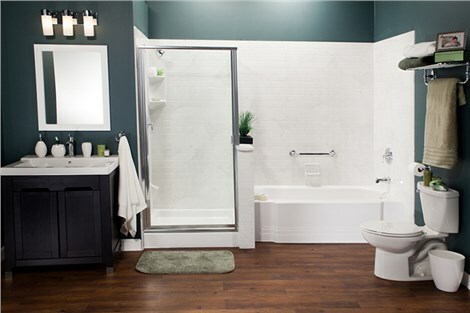 As the nation's premier bath contractor, Bath Planet is revolutionizing the process of bathroom remodeling with our high-quality acrylic and innovative retrofit installation techniques. Our skilled bathroom remodelers have the experience necessary to transform your bathroom into an efficient and stylish space in as little as one day! The high quality of our products and services have earned us both the Good Housekeeping Seal and accreditation with the BBB. Additionally, we are proud to be a Guild Quality member with endorsement by the National Association of Home Builders. If you want stylish, durable bath products that are guaranteed to stand up to the test of time, Bath Planet is the most trusted bath remodeling company in the business. The multi-layer acrylic we use to create our products will never crack, chip, or fade - no matter how frequently you bathe. Our bathroom remodeling contractors also use triple-seal technology for a watertight fit that allows your new bath system to blend seamlessly with the rest of your bathroom. We are so confident in our products and services that we even offer a limited lifetime warranty on all of our acrylic bathroom features! For unparalleled quality and expert care, there is no better choice than Bath Planet for your next home improvement project!